Sorry for the HORRIBLE photo quality which is even worst than the rest of my pictures but dont worry im getting on fixing that. I have an SLR its just a matter of setting it up and using it. 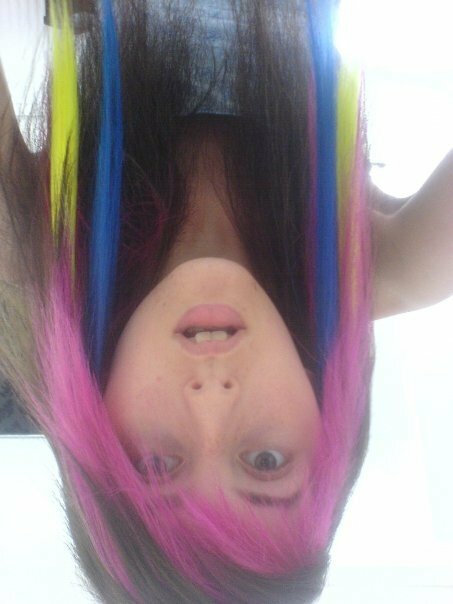 I just found this photo of me three years ago (when i had cool pink hair & my scar was pretty new) in a dress that i hand made one afternoon. I was going to use my sewing machine but it broke just as i was about to start so i just carried on by hand. I used a bunch of materials i had collected over a few months from past projects as i was just finished with my GCSE textiles and pattern i bought in the shops collection of used or broken ones for like 35p. 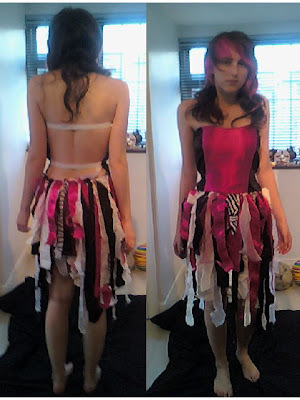 I only used the pattern for the front of the dress but instead of adding the back pannels i just used some elastic, then i ripped all the material i had left and attached each piece on to a lenght of elastic. Then it was just a matter to joining the top and the skirt and getting my brother to take a photo for me.